After my return from Malaysia Angie and I argued constantly. I was fine in Kuala Lumpur, away from my world, my baggage, but when I returned to Yorktown the memories of Seko came crashing in on me. It was summer... a year after we'd been together, going to her concerts, hanging out on the beach, spending every free hour together. Summer reminded me of her. I doubted any future with Angie and didn't know how to tell her without messing up our five year friendship. So I did everything but tell her what I thought and when I finally did we were too far apart. I had so much anger against Seko and the rest of the world I couldn't carry on a conversation without it coming out. It clouded every thought and every decision. I went to counseling and the counselor soon put me on anti-depressant medication. After that I rarely got angry and lost most of my emotions and feelings. I giggled a lot more. I was a zombie and I liked it. The hotel behind where Angie lived in Jakarta, Indonesia, was bombed by terrorists on August 8. At the time I heard about it I wasn't sure if it was her hotel...all I knew was, based on the CNN reports, it was the same area of Jakarta. I rushed home and nearly killed my roomate because he wouldn't get off the computer. I was very pissed off at him and stormed into my room and after serveral tries I reached Angie on the phone. She'd been at work that day...she was okay...and seemingly unconcerned. It was a very scary time. I thought I'd lost my only friend. As was my habit, I increased my riding in July in preparation for the Virginia State Time Trial. 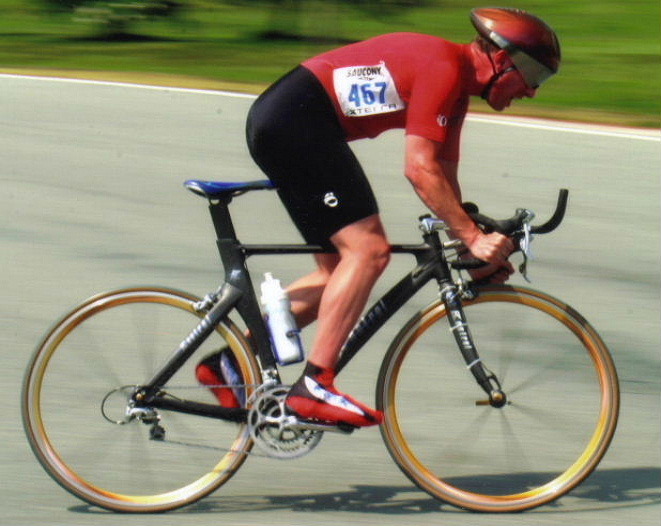 I began riding with the Langley Cycling Club on base during lunch hours. I didn't know how well I'd do and on the first ride we did, my left shifter mount snapped off leaving me dead in the water. After looking at the problem in a parking lot for a few minutes, I wrapped the cable around the downtube and chased them in my smallest chainring for 13 miles. 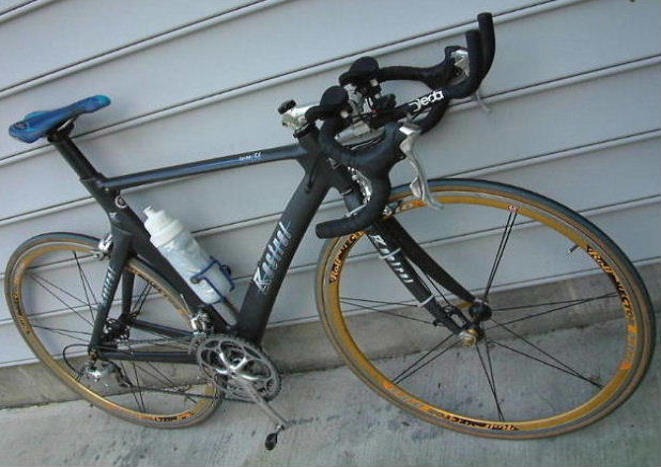 I had no front shifting and limited rear shifting and pedaled furiously in a gear designed only for uphills. I held pace about 300 meters back but couldn't gain on them. With the time trial weeks away, I needed a bicycle fast. So I bought this Kestrel Talon SL frame and slapped my old parts on it. 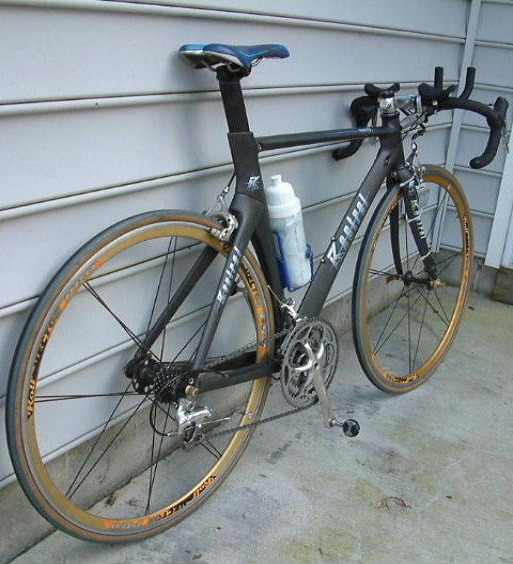 It was an aerodynamic carbon frame, something I've always wanted but never could afford. I'd just found out about this model a week before my Trek broke and at the time said, "Had I known Kestrel made this model I would've never bought the Trek". So now I had it! I managed 4th in the state time trial with a time slightly faster than 2002 but far from my best. 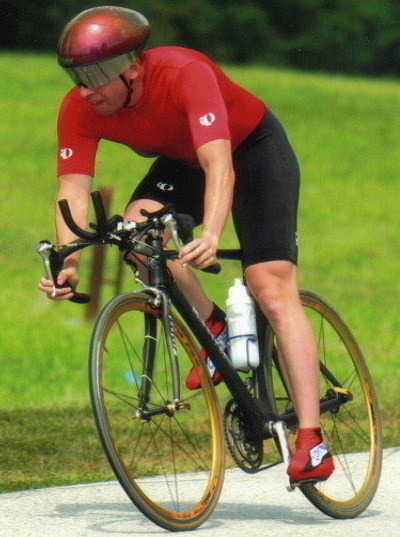 My record in Virgina State Time Trials had been excellent over the years... 2nd, 4th, 3rd, 4th, 1st, 4th, and now another 4th, not to mention second in the Maryland State race in 2001. 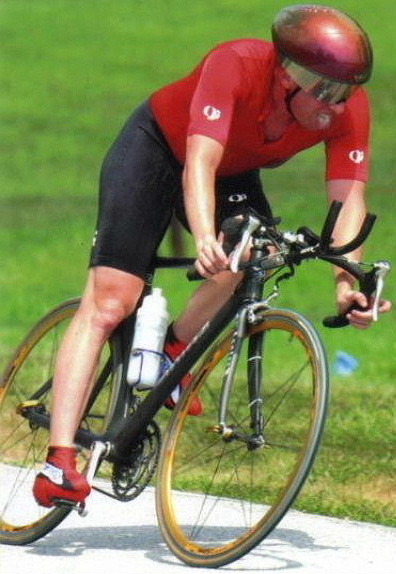 I'd never finished worse than 4th in a state time trial. If nothing else I could say I was decent at time trials. The next week I followed up with a second place in the Cobblestone Time Trial in Richmond. 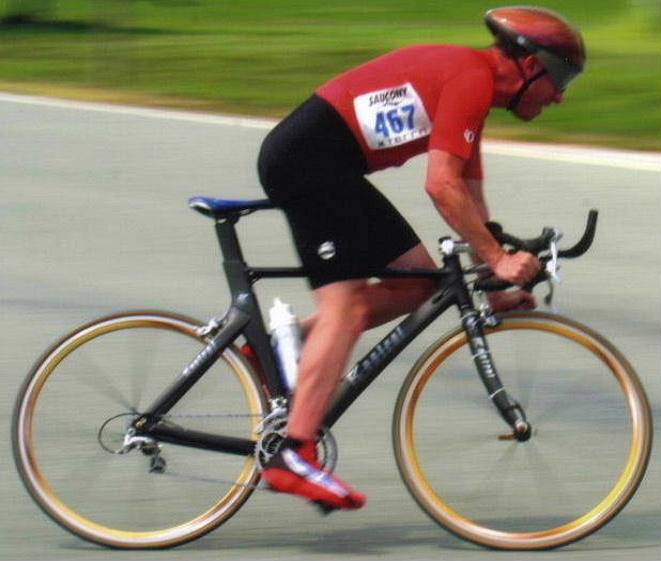 I rode very late in the day when the weather was the hottest and windiest and missed winning by three seconds. It was extremely hot and windy that day. I rode the race at about 95% because that extra 5% effort would have given me a heat stroke. I'm sure I could have made that time up if I'd started with the other top riders in the morning when it was cool and calm. Then I slowed at a choke point because I was approaching another rider from the rear and was confused as to which lane to take. I could have easily lost a few seconds there. I was so hot and dehydrated my tongue had turned white.